Making your chocolate from scratch -- not merely molding chocolate -- is labor intensive and requires fresh, raw cacao beans. These can be difficult to find, but you can also make chocolate from cocoa powder and cocoa butter. Either method requires that you temper your chocolate before molding and letting it cool. This gives your finished chocolate a smooth, glossy appearance. It also makes chocolate less susceptible to warm temperatures, so it doesn’t melt when set out. Ferment fresh cacao beans in a closed wooden box, stirring the beans every two days. Keep the temperature between 160 and 170 degrees Fahrenheit. To maintain the temperature and moisture level in the box, keep your box tightly closed and place it in a warm, sunny area. Fermenting develops the flavor of the chocolate, intensifying the taste of the beans. Spread the beans on a baking sheet in a single layer, so individual beans do not touch. Preheat the oven to 250 degrees F. Roast in batches in the oven for 2 hours, or until the beans make a popping sound. Stir the beans if needed. Peel the beans by pushing down and cracking the hard shell that has formed around the beans. This is the dried white pulp that surrounds the beans when it is fresh. Discard the shell and keep the beans. Pour the beans into the top of the sausage grinder, setting the grinder at the finest stage. Grind the beans by hand until a thick paste has formed. The beans will turn into a fine powder, but the cocoa butter, the natural oils found in the beans, will extrude during the grinding process, turning the powder into a paste. Grate enough cocoa butter so that you have a 3-to-1 ratio of cocoa paste and butter by volume. Mix together. The mixture can be stored in the refrigerator in covered tubs for up to six months, and in the freezer for two years. Measure out cocoa powder and grated cocoa butter in a 1-to-2 ratio by volume. Cocoa powder is cocoa paste that has had all of the cocoa butter taken out of it. To make chocolate from cocoa powder, you need to add cocoa butter back into the cocoa. Fill the pot half full of water and bring it to a rolling boil. Melt the grated cocoa butter in a mixing bowl by placing it over a pot of boiling water, stirring until the butter has just melted. Combine the cocoa powder and the melted butter. Put 2/3 of either type of chocolate liquor -- the blend of cocoa and cocoa butter -- into a mixing bowl and place it over top of the pot half-filled with boiling water. Stirring the chocolate constantly, add sugar to taste. Heat the chocolate to 110 to 115 degrees Fahrenheit. Remove the mixing bowl from the heat and stir until the temperature drops to between 95 to 100 degrees F. Add in the remainder of the chocolate liquor, stirring until it is fully incorporated. Pour the tempered chocolate into greased silicon molds and place these in the refrigerator for 60 minutes. Tempered chocolate can be stored between sheets of wax paper in an airtight container for several months. Store it at room temperature or in the refrigerator. To make milk chocolate, add cream or milk to the chocolate -- no more than 1/8 of the total volume -- during the tempering process. 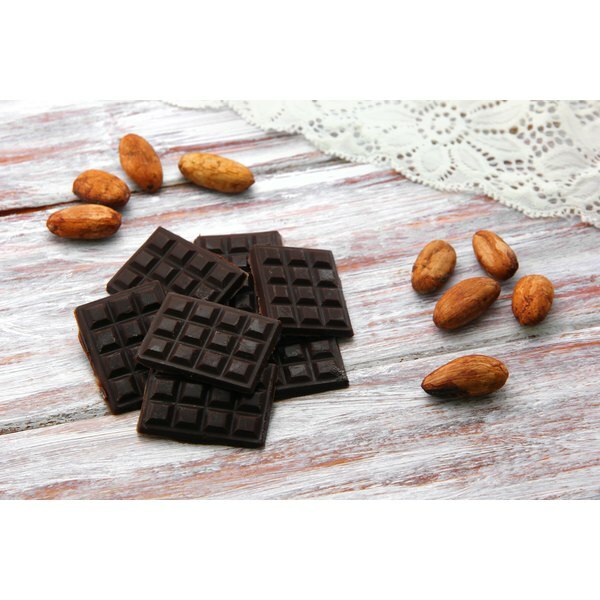 To flavor chocolate, add a ground spice, such as ginger powder, or extracts, such as vanilla extract, to chocolate during the tempering stage. If the precise temperature measurements are not followed during tempering, your chocolate may have a dull appearance and melt while at room temperature.